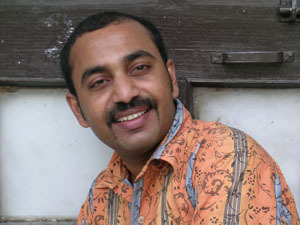 Born in Koothattukulam (Kerala) , India, 1966. Currently lives and works in New Delhi, India. National Diploma in Fine Arts, R.L.V. College of Fine Arts, Kerala. · National Award, National Academy of Arts, New Delhi, India, 1998. · Kanoria Centre for Arts, Ahmedabad, India, 1997. · Artist of the Month, Max Muller Bhavan, Chennai, India, 1996. · Kerala Lalit Kala Academy, India, 1995. · Arnawaz Vasudev Trust, Chennai, India, 1994-95. · Madhavan Nair Foundation, Kochi, India, 1993. · Palette Art Gallery, New Delhi, India, 2006. · The Other Gallery, Banff Centre for Arts, Canada, 2000. · Academy of Fine Arts and Literature, New Delhi, India, 1999. · Artist of the month Max Muller Bhavan Chennai, India, 1996. · Gallery of Contemporary Art Kochi, India, 1991-92. · Kashi Art Gallery, Fort Kochi, India, 2007. · Real 2006, India habitat centre, New Delhi India, 2006. · Satyagraha, Travancore Art gallery, New Delhi, and Kizo Art gallery, South Africa, 2006. · Two man show, Viart Gallery, New Delhi, India, 2005. · Double-Enders, Jahangir Art Gallery, Mumbai, Vadehra Gallery, New Delhi, Kochi, Bangalore, 2005. · India Festival, Milan, Italy, 2005. · The Twilight Zone of Digital Divide an evening with visuals sounds and objects, west end, New Delhi, India, 2004. · Suvernarekha – golden jubilee celebration, National Academy of Arts, Rabindra Bhawan, New Delhi, India, 2004. · Definitively Provisional –II Copenhagen, Denmark, 2004. · 11th Asian Art Biennale, Dhaka, Bangladesh, 2004. · Indian artist for France-French Embassy, New Delhi, India, 2004. · Definitively Provisional ‘Whitechapel Project Space. Landon, 2003. · Invasion, open palm court, India Habitat Centre, New Delhi, India, 2003. · HEAT Habitat Centre, New Delhi, India, 2002. · Small but significant, Academy of Fine Arts, and Literature, New Delhi, India, 2001. · Harmony Show, Mumbai, India, 2000. · Miami Art Festival, Sponsored by Jacob Karpio Gallery Costa Rica, 1999. · 41st National Academy Exhibition, Rabindra Bhavan, New Delhi, India, 1998. · All India Drawing Exhibition, Rajasthan Lalit Kala Academy, Jaipur, India, 1998. · An Ode to independence, Post Card Exhibition, Habitat Centre, India and Air Gallery, London, 1997. · Gallery 47, London, 1997. · Quay Side Gallery, London, 1996. · Kerala State Annual Exhibition, Kochi, India, 1995.